Ruby Satin® is a quality synthetic brush with the shape and feel of interlocked bristles. 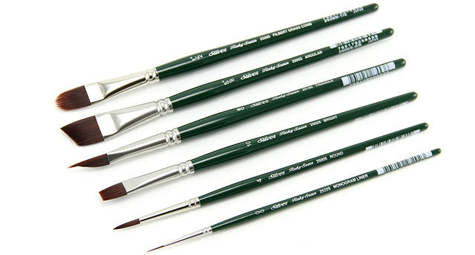 These beauties have a precise snap and excellent color control, no matter if you are using extra heavy bodied acrylics, oils or water-mixable oils. A seamless, nickel-plated brass ferrule and an epoxy seal offer additional protection to the bristles so you can paint with confidence on wood, canvas, and tough surfaces.